If you’ve ever used Linux for a while and started to get familiar with it then you probably used Workspaces (or at least on occasion). Most people who get used to Workspaces find it difficult to live without them and switching back to Windows can be difficult or not even fully possible. Now you can have your Workspaces in Microsoft Windows with Desktops! Desktops is currently at version 1.0, but runs smoothly. By default it comes with four workspaces and is a single executable file. No installation is required at all! So far, I really like the direction that Desktops is going! It seems that a lot of work has been put into it to make it work as intended. 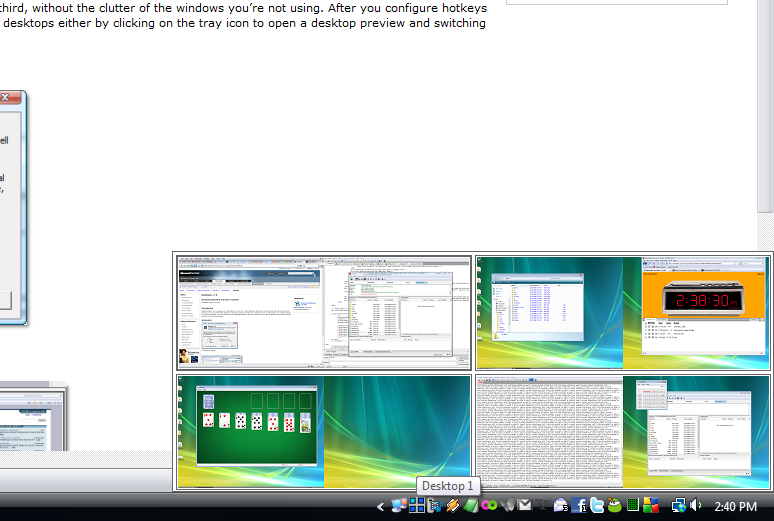 However, I did find several flaws with the behavior and limitations that Desktops currently has. Upon starting, you will notice that none of the other workspace areas are activated until you select them. Selecting them takes a short period of time to configure that workspace and show applications that are apparently pre-decided for all workspaces (such as system tray applications and icons). 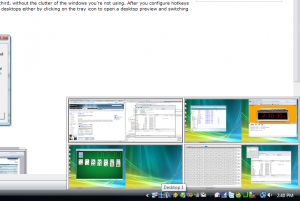 There was no way to drag windows between workspaces and that caused other limitations. Web browsers such as Opera and Firefox don’t like to run more than one “instance” of the application. It’s easy to open more windows to separate your tabs, but what happens when you’re in another workspace and need a browser window? Clicking the little application icon will most likely result in one of the two. You will receive a message explaining that there is already an instance of the browser running (in another workspace of course) or your browser will interpret the action to mean that you need another tab and simply open another tab in the window that is not even visible (on another workspace). I also noticed that Aero didn’t work on workspaces 2-4 on my system. Maybe it’s still too soon to expect flawless performance though. 😛 Maybe these will be fixed in the near future. 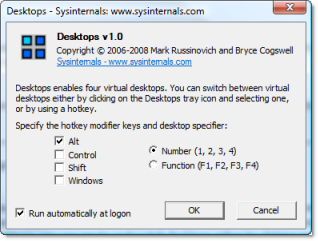 If you’ve followed little tools like this that Microsoft has released in the past then you may have also seen Virtual Desktop Manager which was released a while back. Another desktop manager worth mentioning is Vista/XP Virtual Desktop Manager which offers some features stunningly close to those found in Linux!